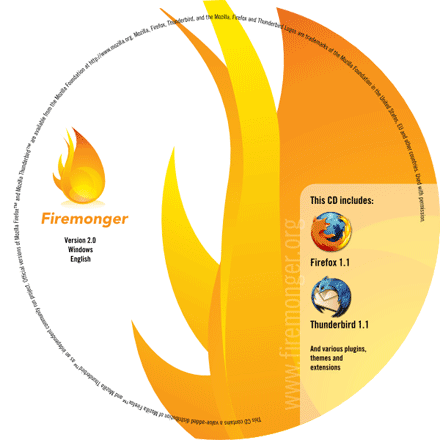 Now that the release of Firefox 1.1 is coming closer, the Firemonger project is preparing the second major release of their CD. 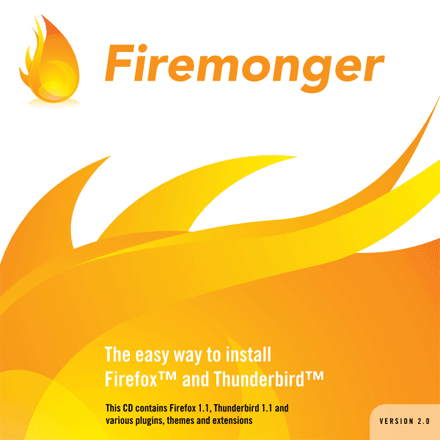 The older version was released just after the release of Firefox 1.0 and contained not only Firefox, but also Thunderbird and various plugins, extensions and plugins. 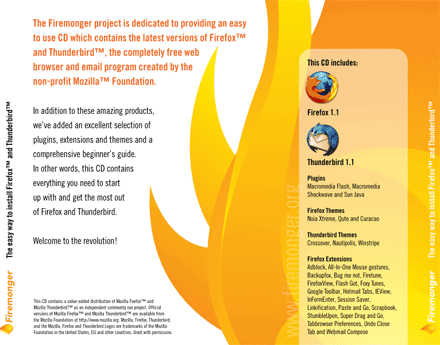 The new release will continue in this tradition and will once again contain everything you need to start up with and get the most out of Firefox and Thunderbird. I created the original Firemonger logo and the original website design, so I was asked to design a CD cover for the new release. The most important requirement was that a volunteer could completely translate the cover to his own language, by using only open-source software. As a graphic designer I am used to work with tools like Adobe Photoshop and Adobe Illustrator which are neither open-source nor free. So I needed a different solution. Luckily there is fantastic open-source SVG editor called Inkscape and Illustrator can export to SVG format. The only problem was a difference in the way fonts are interpreted by Inkscape and Illustrator. For example, when Illustrator exports the SVG file it contains the following font definition: font-family:’TraditionellSans-Bold’; while Inkscape expects the font-family:TraditionellSans; font-weight: bold; Luckily this can be solved by opening up the SVG file in a text-editor and performing a simple search-and-replace operation. How did it go actually printing further? Did you print it to postscript? What about cmyk? Or should these great illustrations be printed by users themselves? Alexandre: the SVG’s will be rendered by Inkscape to bitmap files, which the users will be able to download. They can then print these themselves. For professional reproduction, I am not sure I would use Inkscape. I would probably use the Adobe Illustrator source files, because the end-result can be controlled. Very commendable effort. Beautiful design.